The chemical equation problem type allows the learner to enter text that represents a chemical equation into a text box. The system converts that text into a chemical equation below the text box. The grader evaluates the learner’s response by using a Python script that you create and embed in the problem. You can make a calculator available to your learners on every unit page. For more information, see Calculator Tool. Chemical equation problems use MathJax to create formulas. For more information about using MathJax in Studio, see Using MathJax for Mathematics. To create the above chemical equation problem, follow these steps. In the unit where you want to create the problem, select Problem under Add New Component, and then select the Advanced tab. In the component editor, paste the code from below. <customresponse>: Indicates that this problem has a custom response. 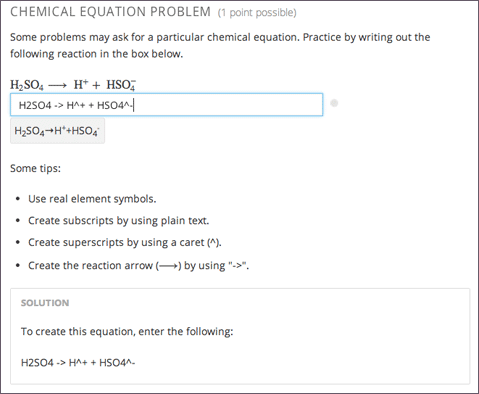 <chemicalequationinput>: Specifies that the answer to this problem is a chemical equation. <answer type=loncapa/python>: Contains the Python script that grades the problem. Indicates that this problem has a custom response. The <customresponse> tags must surround the <chemicalequation> tags. Indicates that the answer to this problem is a chemical equation and creates a response field where the learner enters an answer. size Specifies the size of the response field, in characters. label (required) Contains the text of the principal question in the problem. Contains the Python script that grades the problem. type (required) Must be “loncapa/python”.